During Greece’s match against Gibraltar on Tuesday, embarrassing scenes broke out in the stands of the Karaiskakis stadium when fans chased down and beat a man wearing a Panathinaikos jersey. Around the 70th minute mark in yesterday's FIFA World Cup qualifier between Greece and Gibraltar, embarrassing scenes were witnessed in the stands of the Karaiskakis stadium. A fan appeared in Gate 8 of the Olympiacos stadium wearing a Panathinaikos jersey and he did not go unnoticed. The young fan was chased down by roughly 10 men and was violently beaten as he ran for his life. 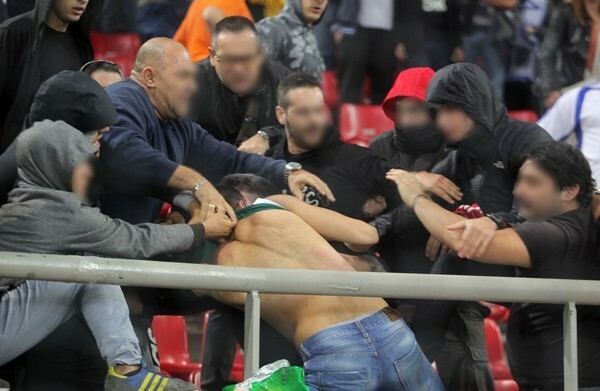 According to the images from the video (below), the attackers consistently punched the young Panathinaikos fan in the head and the result of the attack could have been much worse if other fans did not jump in to help before the stadium’s security intervened (with a delay). The Hellenic Football Federation condemned the incidents and an investigation is underway to find the perpetrators. As of now, one arrest has been made. The man in custody is a 20-year old Olympiacos fan with a violent past and his name was well known to the authorities even before Tuesday’s incidents.